Copenhagenize.com - Bicycle Urbanism by Design: Power to the People - Á vélo citoyens! Power to the People - Á vélo citoyens! A propos the recent article about Bicycle Commuting or Bicycle Culture, the large French organisation Villes-Cyclables [Cyclable Cities] are a good example of how to promote Bicycle Culture. I've worked with them before, speaking at their national conference in La Rochelle last year. 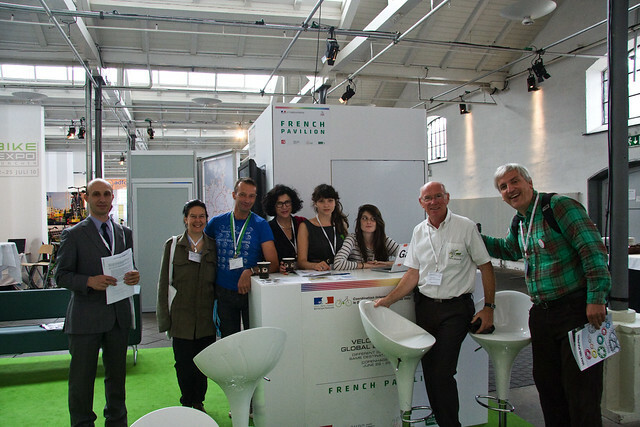 The photo, above, was taken at their stand at the Velo-City Global conference in Copenhagen last June. The Villes Cyclables organisation is huge, representing over 700 French towns and cities. They work hard to promote the bicycle - and bicycle culture - in France. One simple little detail struck me at the Velo-City Global Conference. The freebies offered at stands at such conferences don't vary that much. Whatever Chinese factory that pumps out reflective trouser leg holders (buy a chainguard...) must love these conferences because you could go home with two dozen different ones if you wanted to. Villes Cyclables had a different angle. They were handing out designer scarves. An idea so far from traditional advocacy that it was a joy to see. The scarves are aimed at women - so often alienated by the 'overcomplicated bicycle gear' message - and they are perfect for the growing 'Cycle Chic' advocacy approach that is gaining ground in the vacuum of bicycle advocacy for Citizen Cyclists. The scarves also send a signal to the logo of Villes Cyclables, which you can see on their website. A logo that sends specific signals itself about what direction the organisation is headed. I was lucky to have the two scarves in my bag one chilly evening during the Velo-City conference. 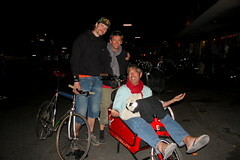 At two in the morning they came in handy for me and Andy Thornley, program director at San Francisco Bicycle Coalition, when I was about to transport him back to his hotel. No... scarves are not the be-all, end-all of the New Generation of Bicycle Advocacy. But they are a good example of how Villes Cyclables, and others, are promoting Bicycle Culture. At the conference in La Rochelle it was also interesting to be surrounded by several hundred passionate bicycle advocates - none of whom were wearing the 'bike gear uniform'. Just regular people in regular clothes, working hard to see more of the same in cities and towns. Role models for Citizen Cyclists. This is why we'll see France continue to storm to the front of the race for re-establishing the bicycle on the urban landscape. Not just the 25+ cities with bike share programmes, but the whole advocacy approach. Bicycle Advocacy 2.0. Regarding the article about Bicycle Commuting and Bicycle Advocacy, a couple of readers sent links. Vladimir, who has also written this article on his blog about the bicycle infrastruture in Paris, sent this link to a Wall Street Journal article about Bicycle Commuting and overcomplication, adding "you're right, that distinction (between Commuting & Culture) does exist." Maya sent a link about a man who has resigned from the Board of the League of American Bicyclists because the LAB has chosen to modernise their advocacy. The man in question calls it the "dumbing down" of advocacy. Saying that the LAB has chosen to promote the "lowest common denominator". Basically, he is an "avid cyclist" who doesn't fancy the thought of Citizen Cyclists muscling in on his pee-marked territory. To hell with rebuilding liveable cities. To hell with The Common Good. It's all about him and his little group of friends. Perhaps bicycle advocacy just got a little bit healthier with that one resignation, however insignifigant in the big picture. At the end of the article on Behavourial Challenges there are other examples of the sub-cultures revolting against the boom in mainstream cycling. There are many, many voices for "cycling", some noisier than others. On the other hand, there are very few voices for "Citizen Cyclists". Mainstream bicycle culture and the people who contribute to it have been under-represented for decades. For too long. Fortunately, times they are a'changing.